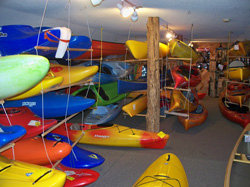 We carry one of the largest selections of canoe and kayak equipment in New England. We have boats by Perception, Wave Sport,Jackson, Dagger, Pyranha, Liquid Logic, Heritage, Mad River, and Old Town. Paddles to suit all needs from Werner, Aquabound, AT and Harmony. Astral Design, Stohlquist and Extrasport Life-vests, IR paddle jackets, drysuits, wetsuits and Yakima car racks. Our store also has a large selection of t-shirts, outdoor accessories and canoeing/kayaking guide books or videos. Be it for whitewater, flatwater, Oceans or just being in the water(pools count). Inexpensive beginner gear or high tech competition equipment, we have it or will get it for you. 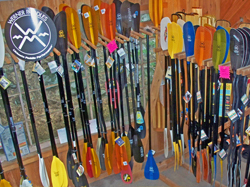 Drop by, we love to talk about paddling and will help you find the equipment that is right for you!